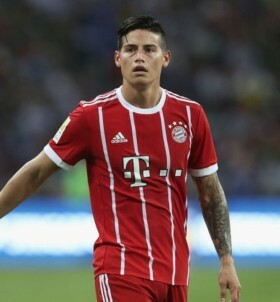 Bayern Munich manager Niko Kovac has played down the recent speculation which has linked James Rodriguez with a potential move to Arsenal. A recent report suggested that the Bavarian giants are looking to conclude the Colombian's loan deal from Real Madrid and the attacker could thereafter join the Gunners on a temporary basis for the rest of the season. However, speaking in a news conference, Kovac has dismissed the gossip whilst stressing that the attacker is motivated to remain with the club for the campaign. "He wants to stay with FC Bayern, as he once said during a fan club visit, he is highly motivated and focused. He can always help us with his quality," he was quoted as saying by The Express. Rodriguez has not featured for the German champions since November with a knee injury but he is expected to return for the Hoffenheim clash on Friday night after participating with his teammates in training.